Three hours until the jam, and I'm currently a blank slate. It's usually a good thing, but now... Not so much. Hello, you can call me Meeshster or some version of it. I'll try my best to participate in the jam as much as I can and start on something I can be proud and sink my time and dedication into. 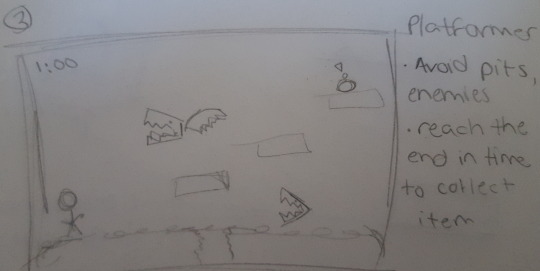 Right now, my only plan is to think of a game concept, setting, start of the 'story' if any, then design and develop characters, creatures, and maybe landscape for it. Overall, my goal is to lock into and develop designing characters for a particular setting and have everything look like its all from the same world. But, I think I might need to have a game for actual turn-in on the 5th. Unfortunately, I don't know what I want to do to remedy that, but I figure I will be creating an 'intro' of some kind for whatever world I think of either in a Visual Novel or RPG form. Maybe a mix of the two, but I'd rather not get too risky given my lack of coding skills. So to condense all of that, please look forward to hopefully seeing a devlog heavy in character, environment, and creature concept and development, and ultimately creating an introduction 'cutscene' or something interactive to the player for the world I end up whipping up. Once I figure things out, I'll edit this OP for it to actually look like a devlog for the project. Until then, if you read this, thanks for reading. Meeshster, Meesh, or Mesha is fine. Or any other creative invention in-between. I've participated in MFGJ 2016 & MFGJ:SE 2016. My goal is to simply just 'do' versus doing something better. Constantly beating a stuffed teddy bear to get my passion for game dev back. My favorite genres lean mostly on RPGs, but as long as it's some good fiction I'll give it a try. Inspiration's next-to-none lately, but 'classics' in my book that I can think of that drove me to my college career have been: the Golden Sun series, FFIX-XI. I do, but I barely practice at all. I've delved in Unity, Stencyl, GameSalad & the Unreal Engine. I was very passionate in the creative process of making games. And I'm back because I have one nagging thread left in the back of the my head that wants to make a career out of it one day. Since I can't read music at all, I've resorted to my next-to-favorite which is animation and 3D-modelling. When I was doing it, I had gotten into pixel art and animation a bit too and was enjoying it. I haven't figured out if it's allowed yet, but I've told myself that as long as I've made assets for a project I've thought of, I'll consider it a completed jam for me. So, my plan is to think of a game idea (hopefully relating to the "Dream" theme) then develop character designs, environmental designs, and maybe creature and/or vehicle designs that would fit in the world of whatever idea I can think of. After that, create them (either in 3D or 2D/pixel, I don't know yet), and exhibit them in some way, shape or form. I figure most of the other components that go into creating a game have been hindering me in the last jams, and at least until I've mastered the one I want to focus on that I would learn to master that first. Then in future jams once my confidence and motivations have lifted up, I can develop an actual jam game and work on things such as coding, writing, etc. I'm not a veteran at any means, but if you're more motivated than I am (you probably are), keep at it! And if you're in a rut similar to mine, listen to that nagging thread I mentioned earlier and force yourself to work on what you want to do in life so you can actually get there, no matter how hard it is to do it. My First Game Jam: Summer Edition community · Replied to Emil in [⚠] Need a Team? Check This Out! Oh, I knew I meant to do something! Sorry, I'm in a team now! My First Game Jam: Summer Edition community · Replied to Forleafe in Pre-Jam Discussion: Introduce yourself! I've been nervous about posting on this for goodness knows why, but here goes! I am a... let's go with Game Designer w/ add-ons... looking for coders/writers/artists/all-rounders! 1. Introduction: Hi! Mesha here. Uh, I have an idea for a game this jam and would like to try to find team members for it! My main goal is experience and getting a creative itch. Oh, and I'm on the EST timezone. I believe it's +5:00 or something like that. Regular 9a-5p schedule on weekdays! 2. Skills: I'm not too confident in saying that I can specifically do something, but I do draw a bit, like writing a bit, and I dig thinking up basic plots and scenarios. Coding is not my strong suit in the slightest, but I will do it if need be! I am not super adept in any of these programs at all, but I know enough to get around! 5. Contact: I have a handful of contacts! But to make it simple at first, let's just start with discord @meeshster! 6. Other: Once again, I do have an idea for a submission this game jam! If interested, let's talk about it via discord or messaging here (I think this has messaging). It isn't completely important, since I could always keep this idea for a private project. No real expectations or specifications for team members or for a team if I am to join one. My main goal is to just have a great, creative time throughout this jam! My First Game Jam community · Posted in [devlog] Dessert Quest! Dessert Quest! : My First Game Jam edition, is finished! I tried doing the 'click image' to go to page thing. Oh well! While I would have really wanted some more detailed Win/Lose/Title/Instruction screens, they get to the point enough for jam submission! I can always go back and work on it some more, right? I'm definitely going to attempt to continue this concept post-jam, and will post progress via my creative Tumblr when I can get to it. I hope everyone enjoys the level, and please throw in any comments if you'd like! I used to be able to pull all-nighters. Like, with no problem. And... And then college ended. And I think my body just said "Yeah I don't need to do this anymore". So, instead of falling asleep at 2:30AM in front of my desk, I fall asleep at 9:45PM in front of it. And then wake up at 8AM with a dog staring at me like why am I not in bed... I don't think I could do an actual all-nighter even if I tried anymore haha. Luckily, I was able to nix a few potential plans and think of something that will probably be decent enough for jam turn-in at least. While I feel like other people could have done as much as I have done in a regular, 48-hour jam, and in an even better quality probably (ESPECIALLY my menu screens, ha).... I'm proud of myself to be able to finish something. Despite that, I'll be yelling at myself that I couldn't done better when I turn this in. I'm just gonna tell myself that all I can do is just do better in the next jam I participate in. Also that the end of this jam doesn't mean I can work on this game more! The layout and enemy placement for the MFGJ level (aka LV 1) is finished! I was going to post it, but I figure it'd be a good idea to keep that under wraps for when people are able to play it. I had to do some resizing for Mac's sprite down to half (128x128 to 64x64 px) to make everything look a bit more uniform. She's a bit blurry now, but Stencyl seems to do a nice job hiding that. I'll probably redo the sprite over to give it clearer lines. AFTER THAT, next will be sprites for ingredients. Mac will have to survive these platforms and obtain the item before moving on. Only one will make it to jam turn-in, but I'd like to give the forum a sneak peak of them all. The next step after that will be simple win/game-over/title/credit screens with a main menu. Then I'll be done! Some will be simple, one-color background screens, but I'll do my best to at least have the title screen illustrated in some way! My First Game Jam community · Replied to deer in [devlog] Dessert Quest! My First Game Jam community · Replied to nadia nova in [devlog] Dessert Quest! My First Game Jam community · Replied to J in [devlog] Dessert Quest! So, work and other errands have completely drained me this week. So it's definitely SUPER CRUNCH TIME for Dessert Quest! Now, it's time for me to find some motivation between now and 11:59PM Saturday to go ham and finish up! I am finally in the part of development that gives me so much joy: numbers. How fast should my enemy NPCs patrol? Eh, let's try 10. Ten is a small number. I laughed for at least five minutes. My First Game Jam community · Replied to NN Chan in [devlog] Dessert Quest! Thanks! I'm really glad I decided to go with animating her hair as well. Without it it's pretty stiff! I WAS supposed to be working in Stencyl but... Then I got... enemy ideas. Hungry animals in Mac's way! There appearances will vary on what kind of environment Mac is in while searching. The pug will probably be in town levels while the bunny will be in the forest! 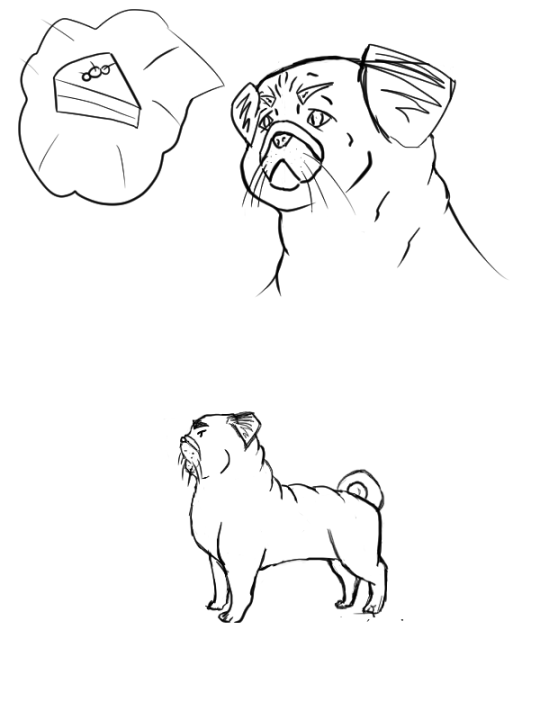 I got way too detailed on the pug I feel bad for bunny. Style consistency is a myth. Is... Is the plant friend saying "Work hard for the money"? I hope it is. This is fantastic. Mess around more with collision and jump/gravity. Well, I'm at a complete standstill. Been trying to test animations on Stencyl for hours, and when I go to test the game, I just get background. None of the tiles or no Mac. :/ Can't seem to find the issue. On another note, I did have intentions to have pixel character portraits for the dialogue bits of my game (if I still finally decide on doing that). Due to time, I believe I'm going to nix that. So sketches of Dessert Quest! 's NPCs will more than likely just be for logging purposes now! Going to just focus on sprite making for Mac and the obstacles that creatures that'll be in her way! This is very neat so far. Can't wait to see what's next! My hands have been numb for the past hour. Also I'm surprised it's only been 2 hours since my last post? So I've been working on that since then... I feel like I've been at it for ages! Now I'm gonna animate these babies. Hopefully I'll get done tonight. That's the goal~ Tomorrow: backgrounds. The owner of 'Bonnie Bakery'. Gets lost easily, so she sticks to business inside the shop. 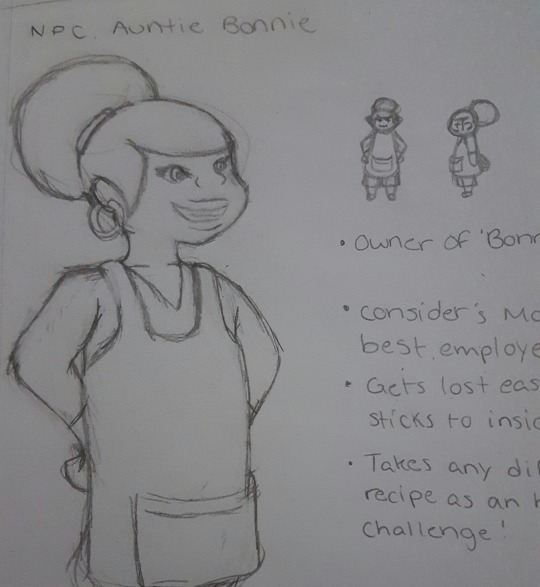 Once I've one Mac's sprite sheet tomorrow, I can start on Bonnie's! She won't be playable, so it'll be some basic ones for screentime purposes. Oh man, thanks a lot! At first I was overthinking the style for character art then I sat down and told myself to just go with it and the concept would find a style itself. It's really worked so far, and it's really killed some of the free time I've been wasting thinking too hard on things haha. And I did try to tamper with contour line colors a bit. Thanks for throwing the term at me! I've always seen it and even done it myself messing around from time to time but... Never knew a word for it lol. here is my art/gamdev blog! im really glad about this jam since ill be finally putting it into use! My First Game Jam community · Created a new topic [devlog] Dessert Quest! Hello, I am Meeshster and this is Dessert Quest! A 2D Platformer of tasty proportions! Also logging here, so follow where you'd like! 1.6.2016 ; Changed the title name a little. It's funny, but the small 'q' was bothering me! 1.10.2016; Slight overhaul done on development direction as well as my devlog! 1.15.2016; Overdue posting and updates: resizing Mac sprite, LVL 1 readjustments, enemy A.I., bonus enemy!? A very rare pastry sampler has been ordered by the town mayor! Can Mac collect all of the ingredients before the party?? At first, I was torn between Visual Novel, Puzzler, and Platform genres. 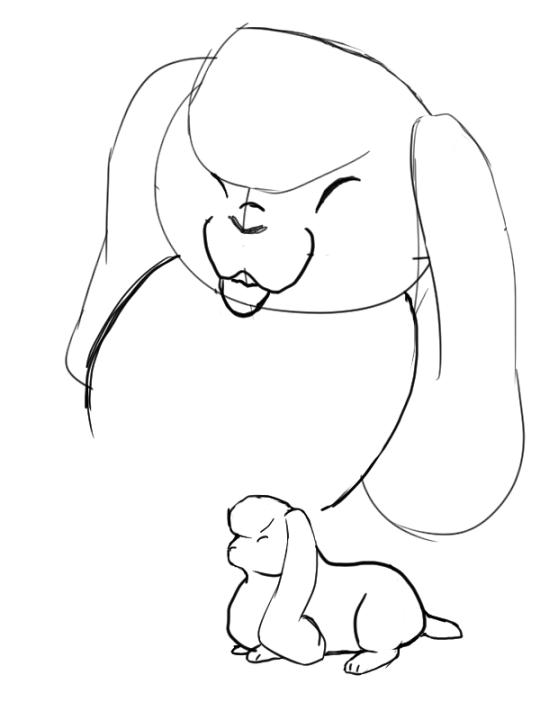 THEN, I had decided on doing a VN/Platformer hybrid. Now... Let's just do a Platformer! I told myself that if I feel like pushing this idea further past MFGJ, then I can always add something like dialogue scenes later! For now, let's try to get the meat and potatoes done and let Mac collect the sweets and flour! If there is time, we'll have a time score! 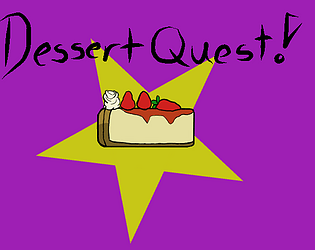 The player character of Dessertquest!. 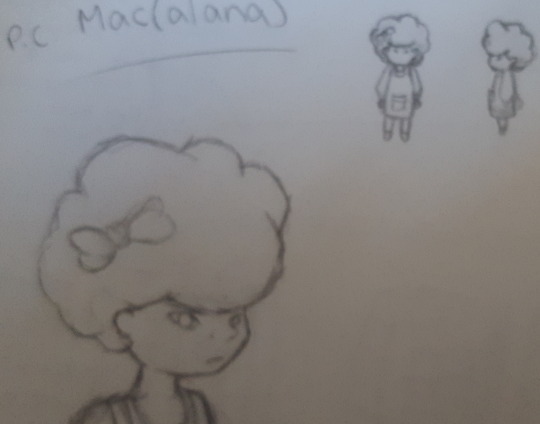 Macalana, Mac for short, works summers at her Auntie Bonnie's local bakery. Occasionally helping in the kitchen, she is usually the first to go to for running errands as well as deliveries. As a result, there was no doubt Mac would be asked to be the sole ingredient collector for this rare recipe! Hungry animals after Mac's ingredients! They're... way smaller than I thought. I figured half the size of Mac's sprite would be good, but maybe not. We'll see soon. Hello, you can call me Meeshster, or Meesh! I am a recent graduate of Computer Game Design and I am trying my best to build up enough motivation and inspiration to build my two-year old portfolio. I stumbled upon myfirstgamejam and decided to finally give this thing ago; with the much longer schedule, I really had no reason to refuse this jam like I have others! Through college, I have had some experience with Unity, UDK and Gamesalad engines, as well as Autodesk Maya and 3D Studio Max. Even though I've done a few small projects in Gamesalad and worked with Adobe Suite, my major focused mostly on working in 3D workspaces. Since then, I have tried out Construct2, which I enjoy the most out the other engines I've used! My biggest goal is to get out of this 1.5/2 year creative slump that I've been in since the end of my college career. Although I still really want to work in the game industry, I have not been willing enough to prove my worth through portfolio building and just learning and re-learning programs and tools as I should. With this game jam, my number one priority is to kick that in the bud and get started with my career, no matter how small the step is. Other than that, I'd like to learn a few new things. Build up my pretty low experience in coding, as well as strengthening my drawing and writing skills. I would definitely be happy to meet a few friends along the way, too. Initially, my plan was to use RPGMaker since I haven't been able to mess with my copy just yet. But unfortunately, my Windows desktop is in the shop for a malfunction and won't be shipped back until 4 days before the jam ends. So, a lot of my programs of choice have changed up. So now, I'll be using Stencyl for my engine. As for my digital and pixel drawing, I'm using FireAlpaca and Clip Paint Studio. A handful of assets, including scene business, sounds and music will be coming from free sources and will be credited accordingly!